Disney WDW - Pin of the Month (March 2000/Epcot) This is the Limited Edition Pin of the month (POM) for March. It celebrates the opening of the EPCOT park in 1982. It says "Commemorative Edition-Opening Day-1982". 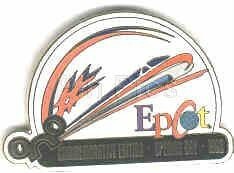 This pin features a artist interpretation of Spaceship Earth and the Monorail.